Q. Why can't my instructor view my assignment? Please be sure you have submitted the assignment into the proper area. Often, students submit assignments into a draft section. 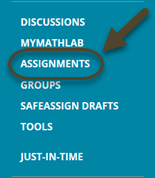 Click on the Assignments link on the left-hand navigation menu in your classroom. If the assignment was submitted properly, you will see a preview of the document. If not, you will see the upload screen.